Having a catheter for hemodialysis leads to many more deaths and hospitalizations compared to having an access in the arm (or if the arm is not possible, in the leg). Other than coming for dialysis, making sure that you do not have a catheter is the most important thing you can do. If you have a catheter, you should be trying to get a better access as soon as possible. Every day counts. There are several step in getting an access in your arm. First you need to have vessel mapping which is a radiology study that shows where the arteries and veins in your arm are best. Then you need to see the vascular surgeon. 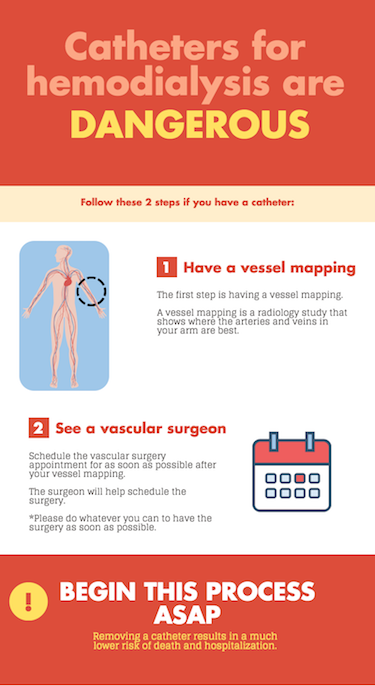 As soon as you know the date of your vessel mapping, you should schedule the vascular surgery appointment for as soon as possible after the vessel mapping. Your surgeon will then schedule surgery. Please do whatever you can to have the surgery as soon as possible. Often patients put off the surgery and end up getting seriously ill from their catheter. Having a catheter is a medical emergency and you should treat it that way. You may see other patients in the unit using a catheter and not getting an access in their arms. Some of them have no possible veins to use for an access, some have medical conditions prohibiting them from getting a better access and some are refusing to get a better access even though it will eventually make them sick.